Harold Bridger’s Double Task has been the foundational methodology underpinning our existence at the Bayswater Institute for the past 25 years. We are excited about the potential it offers and we know, that we haven’t made the most of it yet. This year, in 2018, we are hoping to make it more accessible to more people, because we have found that it provides the key to improving effectiveness in groups, increasing tolerance in teams and ultimately improved performance at an organisational level. The Double Task is deceptively simple at its core. It invites people to work on the purpose and task of the group (Task 1), at the same time as reflecting on how they are working together on that task (Task 2). The underlying belief is that by reflecting on and improving how they work together, they will achieve their ultimate object more easily and effectively. It is simple but it is not easy. Inviting groups to reflect on how they work together can generate in-depth and powerful conversations. These have the potential to be transformational, if we can navigate our way through them to the learning. Our task at BI is to support people to become better navigators, using a variety of processes, which we hope eventually individuals and groups will take on, use and develop for themselves. We are calling our approach GroupAware. Our objective with GroupAware is to provide leaders with a rapid and exciting means to engage in the work of groups in a reflective manner and thereby to gain a clearer understanding of group dynamics. Our challenge is to steer a course between going deep enough for real change to take place, but not so deep that the group becomes mystified and stuck. We find that some people do develop an interest in some of the underlying principles of the Double Task, which is rooted in socio-technical and psychodynamic theory, and they can subsequently delve as deep as they like. People at the BI are happy to facilitate this deeper exploration if required. In our work developing a GroupAware approach within Wisdom in Groups, we have drawn some inspiration from the work of Jon Kabat Zinn. He was a pioneer in the development of Mindfulness, which has proved an immensely helpful practice for many people. Mindfulness has deep roots in Buddhism, and both psychoanalytic and psychological interventions such as Cognitive Behavioural Therapy. But Kabat Zinn developed it into a straightforward and simple practice. Mindfulness is an easy and useful gateway to a deep field as well as a valuable method in its own right. Thrilled to be working with Jo on the WiG event this year. Briefly, I am CEO of the BI and Co-Director of Wisdom in Groups. I should say now that the realisation of the Wisdom in Groups event is the outcome of a life-long journey. Over the last 35 years I have worked with groups in many countries and many organisations. I have enjoyed working with others in their problem structuring and count myself to be fortunate and privileged to have learned with others who are often struggling against overwhelming issues. I have made use of many interesting and useful methods but have gradually been making my way to a truly reflective and practical group dynamics process. A process which is systemic and innovative, relatively straightforward in presentation and engagement yet capable of almost unlimited exploration in the depths. Harold Bridger’s Double Task model is key and central to this but in Wisdom in Groups a variety of sympathetic and provocative additions help to produce what feels to me to be a bewitching process. The future of civic society is contingent on the coherence of humanity working together at scale. It is my belief that we have always been at our best when we are at our best together. Wisdom in Groups seeks to find that ‘best’ and help delegates to attain and retain the means to the end. I am truly excited by the prospect of Wisdom in Groups and co-learning with you. Positioning a company in a market is now a complex and multi-layered challenge. With many channels to communicate with potential customers there is potential for messages to become fragmented and diluted. The “Crafting your Message” workshop starts by reviewing your position in the market and linking this back to your strategy and plans for sustainability and growth. Whether you are promoting a product or service the approach develops your key themes about what you would want your potential customer to know about you and your company. The afternoon then goes on to explore these themes and build an approach that provides coherence and consistency across you communication plans. By bringing solid business analysis techniques together with storytelling approaches utilised in documentaries and film the day provides a unique insight into your communication planning. The approach used in “Crafting your Message” is not industry specific and can provide broad and deep support for a wide range of sectors. However, the team has particular skills in digital health and working with health and social care. With the need for new ways of doing things in these areas the investment of one days work into the approach can help short cut some of the challenges in these areas and provides real value for money in accelerating your understanding. Christmas saw the publication of another forecast of the number of jobs that are at risk because of the march of robotics and artificial intelligence. This time it was the IPPR (Institute of Public Policy Research) forecasting that up to 44% of UK jobs are at risk across wide sectors of the economy. There are now many forecasts of massive job losses and attention is being focused on a world where a small proportion of people (the highly skilled ones) will be employed and the rest will be out of work and poor. Who will manage the change? How do we reconcile these two different perspectives on the future of work? Our clever technology may be very good at doing the operational work but it cannot help us make sense of the messy world of international trade, market forces, competitiveness, social change, government action and technical innovation. And it cannot determine what we should do to take advantage of new opportunities and defend against threats. AI may be smart but it is a narrow intelligence with a clever understanding of a specific work domain. Indeed, such narrow AI is also known as weak AI because it cannot replace the breadth of capabilities of a human. However imperfect they may be, human beings are currently the only general purpose intelligent resource we have that can make sense of a confusing, changing world – sentience is known as strong AI. How is a work organisation to manage in a changing world with a small labour force and a large and sophisticated technological base that may be difficult and expensive to change? The small labour force may have a big agenda: to manage the technology and make sure nothing goes wrong, to monitor the outside world and spot opportunities and threats and to design and implement new ways of working to meet changing requirements. And to keep doing all of these things all of the time. There are many reasons to predict that this model of future work organisations will be ineffective and could be dangerous. One of the reasons for this prediction is what we know about how work actually gets done. Every study of how work actually gets done shows that it is rarely done strictly according to the formal processes specified that may be embedded in the technology. The people in the work system embellish the formal processes with their own knowledge, often tacit and undeclared, in order to give work delivery the flexibility to meet varied and emergent requirements. They are the ‘oil in the system’ that ‘keeps the show on the road’. They recognize what is new and different, learn how to adapt, and add new, often unspecified, procedures to the repertoire of the organisation. In doing so they often have to ‘work around’ inflexibilities in the formal system to get work done and meet customer requirements. As a result in any well-established work system there are people who have a deep but often implicit understanding of how the system actually works and a learning capability that means there is a bottom-up process of adaptation and evolution in place that responds to local changes. The danger of the current narrative about robotics and artificial intelligence is that it implies the replacement of this human resource with technologies that will produce the work on their own. If that is the case not only will work systems become less resilient and adaptive but all the collective tacit knowledge will be lost. And as the saying goes ‘you don’t know what you have lost ‘til it has gone’. Immediate cost-effectiveness may be a dangerous objective. The key argument for automation may be economic – you get greater and more reliable productivity from robots and they are cheaper than human resources. That may be so, but you also have to consider what you might lose…. Knowledgeable and skillful human resources provide a sense making resource that can cope with the unforeseen. We need to keep a general sense making capability at all levels within the organisation; to keep a watchful eye on our technology and to provide flexibility and adaptability wherever it is needed. But to be effective people need to keep their knowledge and skills up-to-date and that means actually doing the operational tasks some of the time. So, enabling them to ‘keep their hand in’ is an important design criteria for future systems design. Having people who understand the task domain means there is a double-task resource to add significant knowledge to planning future developments. Task 1– getting today’s work done – has dominated. People also have Task 2 abilities – to step back and reflect, to review their performance, to see what can be improved etc. The more they can do this, the better chance the organisation has of coping with the need for continuous change. Helping people and organisations develop their Task 2 capabilities is an important part of the Bayswater Institute mission. It could be that one of the consequences of robotics and AI will be that people need to spend less time on Task 1 and they can spend more time on Task 2 – in particular thinking about how the work system may be changed to meet new challenges and opportunities. Exploring the potential impacts up-front would seem a good investment in that this is a global challenge and will generate new requirements of the work force that could benefit from planning rather than reacting. https://www.bayswaterinst.org/wp-content/uploads/2017/10/header-logo-white-blend-deeper-top.png 0 0 Adam Hoare https://www.bayswaterinst.org/wp-content/uploads/2017/10/header-logo-white-blend-deeper-top.png Adam Hoare2018-01-09 10:36:182018-11-21 18:23:12The Future of Work: Automation and Continuous Change? People are the key to sustainable growth – who knew? 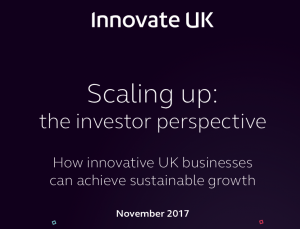 In a report “Scaling up: the investor perspective” released in November, InnovateUK reported on research undertaken, on their behalf, by Ebiquity. The goal of the research was to understand how innovators see the challenge of scaling up innovations in search of growth. This was compared with the view of investors from venture capital firms who are experienced in evaluating companies and their prospects for sustainable growth. The results show an interesting divergence in the value placed on the role of people in the business. The results are based on qualitative and quantitative research with a total of 250 businesses and investors undertaken between June and September 2017. Four ‘perception gaps’ were identified as areas of divergence between investors and innovators. These are areas that represent deal-breakers for the investors. At the Bayswater Institute, we are interested in people. As an institute built on putting social science to work we know that every business context starts with the people. We spend some of our time evaluating workplace situations where technology is disrupting work practice. Here, we repeatedly witness that the tendency is to see the sale as a Technocentric Push. To sell a capital item and let the organisation manage the transformation enabled by the technology. This rarely works as it ignores the embedding of technology in work practice. A sociotechnical perspective requires that the social and technical system is developed as a whole. People are at the centre of any change and approaches that ignore the four areas of divergence identified are poorly equipped to address the challenges that brings. In our work with small and medium sized enterprises we often see companies bringing in consultancy around the technology or market access and completely ignoring the four areas of: communication, adaptability and resilience, chemistry and cultural fit. The institute adopted and developed an approach, many years ago, based on the “Double Task.” This is specifically aimed at separating out daily activity, or task 1, of an organisation from the task 2 underlying practices that are working in the background at a subconscious level. Surfacing and addressing some of the task 2 assumptions and practices provides people with tools and techniques that directly address the four areas of divergence identified. We are running our new Wisdom in Groups residential in April 2018. Here we will empower eighteen people to recognise and work on task 2 as part of their daily activity. In 2018, we will be announcing single day workshops to bring the double task approach into organisations to assist in identifying opportunities to improve their task 2 capabilities. We believe, as the report above indicates, that getting your management team investor ready is synonymous with your ability to be ready for growth and sustainability as an organisation. https://www.bayswaterinst.org/wp-content/uploads/2017/10/header-logo-white-blend-deeper-top.png 0 0 Adam Hoare https://www.bayswaterinst.org/wp-content/uploads/2017/10/header-logo-white-blend-deeper-top.png Adam Hoare2017-12-15 16:00:472019-01-14 15:03:32People are the key to sustainable growth – who knew? In this book, Lisl Klein and Ken Eason look at the various issues involved when attempts are made to make use of the theories, methods and findings of the social sciences in practical affairs. They consider how human and social considerations may be successfully integrated with technical and economic ones in the design and development of organisations at work. Their study is both empirical and theoretical. Its core is the examination of fourteen case studies from manufacturing and service organisations in Britain and Germany. The various projects were carried out by units within the organisations themselves, by university departments, commercial consultants and an independent research institute. Outside the field of organisations the the authors consider the background and strategies of a number of individual practitioners, and also an attempt at national level (in Germany) to make systematic use of research. Their study is informed by their own extensive experience as researchers and practitioners of social science. The book concludes with a discussion of what contributes to successful practice. Its findings will be invaluable to all social scientists interested in the application of their disciplines as well as to potential clients in the world of business and industry. 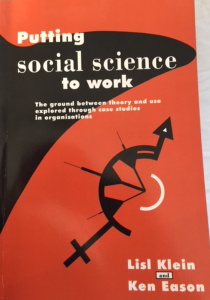 Published in 1991 the book remains relevant to contemporary issues of social science utilisation in organisations. It recognises the challenges of the social science practitioner in engaging with varied and complex dynamics within organisations. Further, that the goal of behaviour change is not well served by “packaged” approaches but must begin with the current situation in action. The case studies resonate with current attempts to introduce technology into the workplace and the recognition that the social context of behaviour change plays a key role. KLEIN, L. & EASON, K.D. (1991) Putting Social Science to Work. Cambridge University Press, Cambridge. It is widely accepted that effective implementation of new technology into work organizations needs an integrative approach in which developments in both technical and social systems are considered. Furthermore, success depends upon the effective participation of significant stakeholders in this process. This article reviews the methods available for this purpose and concludes that a particular weakness is the methods that can be used to generate and review socio-technical system opportunities early in the development process. Whilst methods exist to support stakeholder participation at this stage, they need to represent future socio-technical opportunities if they are to make an effective contribution. This article presents the ORDIT (Organizational Requirements Definition for Information Technology Systems) methodology, which uses responsibility modelling as a basis for constructing socio-technical systems opportunities. The application of telemedicine in health care is presented as a case study to demonstrate how this method can be used to construct and evaluate socio-technical scenarios. Virtual organisations, in which the technology mediates the interactions in the social system, are an emergent form of socio-technical system. 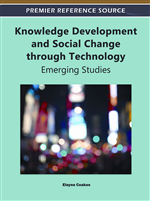 This chapter reviews the concepts and techniques of the 50 years of socio-technical systems theory development that preceded the internet to examine their relevance for the study of the virtual organisation. It first examines the socio-technical system concept of work organisation in relation to the quality of working life and relates these issues to contemporary forms of virtual organisation. 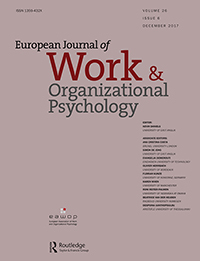 It then examines work organisations as open systems and explores the implications of task interdependencies for the delivery of operational work. It questions whether socio-technical concepts are appropriate for emergent forms of virtual social community and concludes that many socio-technical characteristics are also likely to be found in these forms of organisation. The chapter then examines the implications of a technology that mediates communications between people in the social system. It concludes with a plea that we go beyond the design of technical systems to support virtual organisations and, in the tradition of socio-technical systems research, concern ourselves with the joint design of the social and technical components of virtual organisations. We may define virtual organisations as enterprises in which people engage in a collective mission remotely from one another through the medium of information and communication technologies. Some enterprises started as virtual organisations in order to exploit the capabilities offered by the internet, i.e. they have never existed as ‘bricks and mortar’ organisations where staff worked and customers visited. In the commercial world, Amazon and eBay are examples of such organisations and in the social networking world, FaceBook and Twitter have developed in a similar way. The majority of organisations, however, originally operated and offered their services from physical premises and may be on a journey to becoming progressively more virtual. Several authors have used maturity models to define the stages through which organisations tend to pass as they become more virtual.